I am using turbo capture mode on Droid Scan Pro. When I tap the capture button, take a few snapshots with the built in camera, and then use the back key to return to Droid Scan, the images I just captured are not imported. Instead, I get the message "No recent captures found." Is there a fix for this problem? Yes. The HTC Droid Incredible and similar phones ship with a generous amount of internal storage (typically 8 gigabytes) and as a result don't require an external store (a micro SD card) to store photos and music. Unfortunately this internal storage is private, and Droid Scan can not access the photos stored there in the way it is designed to. There are two possible solutions to this problem: (1) Use Droid Scan without an SD card, accepting some limitations, or (2) Install an SD card and modify your settings so that all the best features will work. 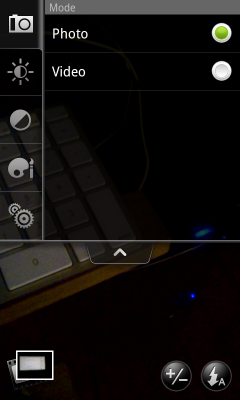 (1) If you prefer not to install an SD card, Droid Scan can still be used, with limitations. The only way to access photos will be to import them one at a time from the Gallery app. (2) If you want to use all the premium features of Droid Scan, you can do that by installing a micro SD card where photos will be stored (they are inexpensive). 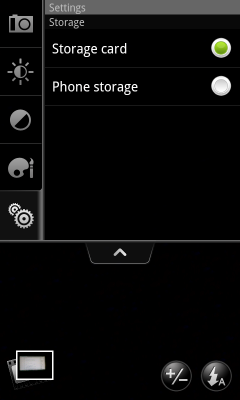 Once the SD card is installed, a setting needs to be changed in the Camera app as shown below. Hit the Menu button or open the drawer to reach this screen. Click the gear icon on the bottom left, and then click Storage to reach this screen. Make sure "Storage card" is the selected option. That's it! With this simple change all features will work perfectly. Note: Since there are many devices in the market, with slight variations among them, that may have this issue, and we can't cover every one in detail, it is recommended that you install the free version of Droid Scan and experiment to make sure this is a workable solution for your phone, before purchasing the premium app.